Review: The Stokes Field Guide to the Birds of North America,, "among best photographic guides... ever"
As a photographic resource for geographic variation, it is without equal, and the project of "quantification" is an interesting way to inspire birders to look more critically and more carefully at their birds... it is highly recommended as one that every birder can use with pleasure and with profit." For the full review go here. So this is what it looked like here this morning. Very beautiful, but, really, snow before Halloween! Much more snow is predicted for upper East Coast on Sat./Sun. so look out! The Contest to win an autographed copy of our new field guide. 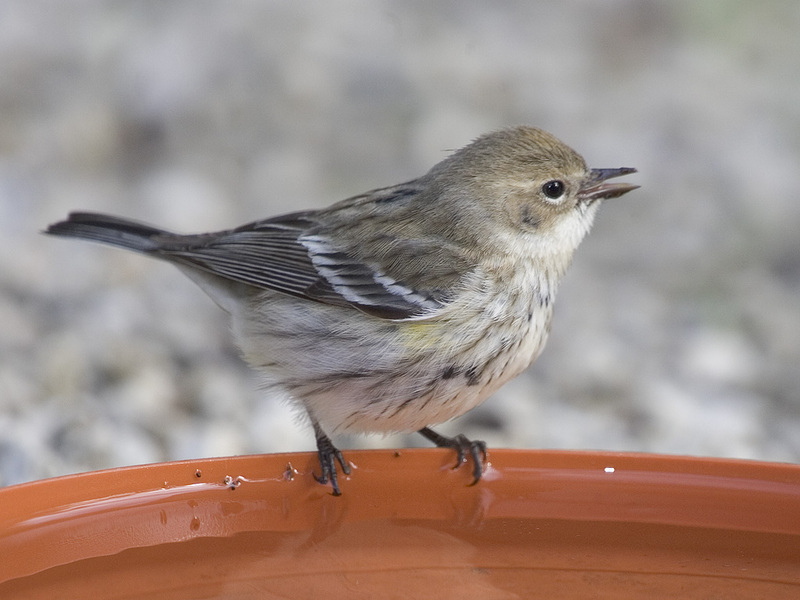 The bird you had to indentify correctly to win is a Yellow-rumped Warbler, 1st-winter. f. of the subspecies coronata. This used to be considered a separate species and was called Myrtle Warbler. 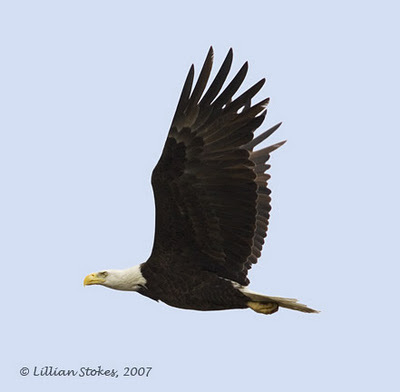 The above photo appears on page 610 of The Stokes Field Guide to the Birds of North America. 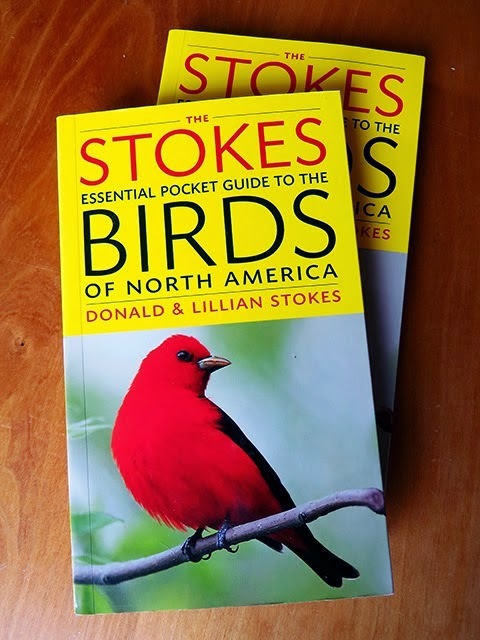 And the winner of the contest for an autographed copy of our new, The Stokes Field Guide to the Birds of North America is... drum roll... Howard Staples! Congratulations and thanks to all of you who entered! "1st Winter: Similar to ad. winter. 1st-winter m. and f. practically indistinguishable. 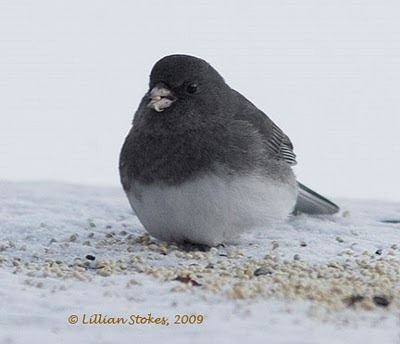 1st-winter female can be very drab, with yellow on breast sides faint or absent." Aside from the correct answers, some people had other guesses including, vireos, siskins, kinglets, flycatchers, mockingbirds, and other warbler species. Bird identification is hard and a continual learning process. We ourselves are constantly learning. We find that looking carefully is a key part of becoming better at bird identification. Experts we know look very, very, very carefully at all the parts of a bird and even they can make mistakes. Yellow-rumped Warblers indeed have yellow rumps and that is a sure clue to their ID. But you often do not see the yellow rump, making their ID in fall more difficult. On the above photo notice the very faint yellow patch on the side of the breast. Almost all Yellow-rumped Warblers in fall have this and it is often a more visible clue than their yellow rump. Notice also the wing-bars and streaked breast, the chin is white. You can also see that the undertail coverts (area under the tail) are white. There is a small, slender, pointed bill, dark mark on the cheek that hints of a mask, slight white line above eye and whitish crescent below eye. "Similar winter Palm Warbler has yellowish rump but bright yellow undertail coverts and pumps its tail; similar winter Magnolia Warbler has yellow rump but is yellow below; similar winter Cape May Warbler has yellowish-green rump and is smaller; similar imm. 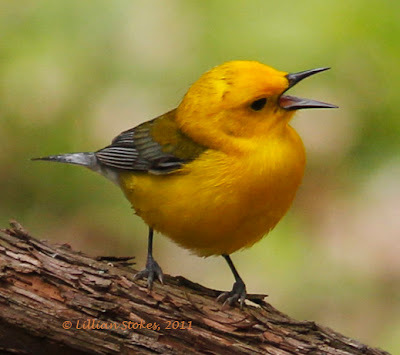 f. Pine Warbler lacks yellow rump" and would have faint or no streaking on breast. Shape and size are important in identifying birds. Kinglets are very small birds, smaller than warblers, and have unstreaked breasts. Vireos are slow-moving, somewhat large-headed, dull-colored birds with larger bills than warblers and unstreaked breasts. 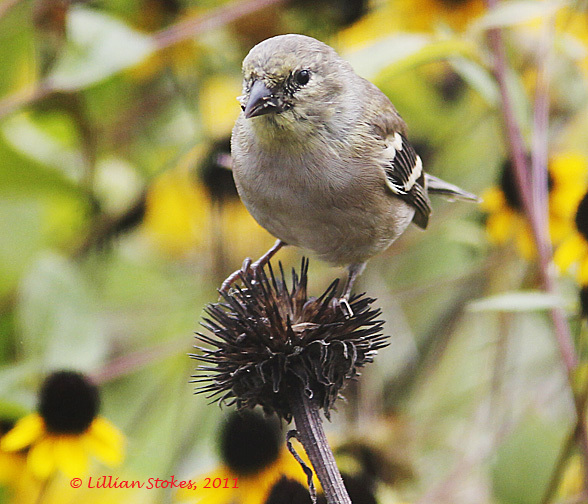 Siskins are streaked brown with yellow on the wings, and have rather conical finch bills that are broad at the base. Thanks to all who entered the contest we hope you had fun. Continue enjoying the birds. 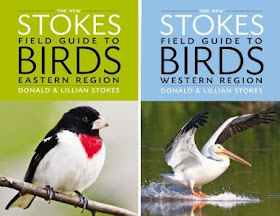 Win an autographed copy of The Stokes Field Guide To The Birds of North America! To win, identify this bird. Hint, it is not a sparrow. It is not a Cape May Warbler. Photo was taken in Sanibel Island, FL in late winter. Send us your answer by midnight, Wednesday October 26th. CLICK HERE TO RESPOND. We will put the names of the people with correct answers in a hat and drawn the winner. Winner will be identified on our blog on Thursday, October 27th. 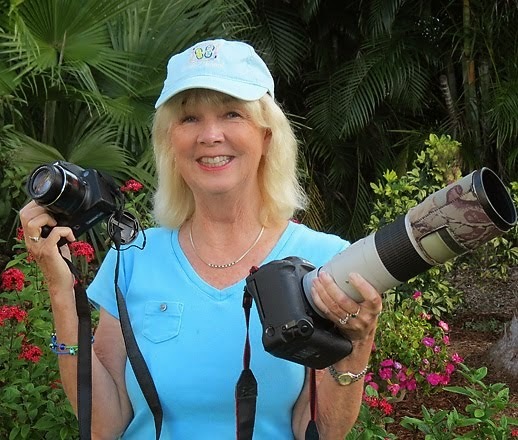 Win an autographed copy of The Stokes Field Guide to the Birds of North America, the most complete photographic field guide to North American birds (includes over 3,400 stunning photos and covers 854 species). We are giving away an autographed copy, and celebrating the one year anniversary of our best-selling, The Stokes Field Guide to the Birds of North America, now well into its second printing. Yeah!! "the most spectacular compendium of North American bird identification photographs ever assembled between two covers...resets the bar for North American Field guides"
"strong candidate for best field guide ever"
"bursting with eye-popping images...the Stokes now have the most complete book on the market"
"A Masterpiece. The Stokeses..have blown me away with a field guide to birds"
"This is a guide that leaves nothing out... The Stokeses have taken the medium about as far as it can go in a single volume"
Here is a link to reviews. 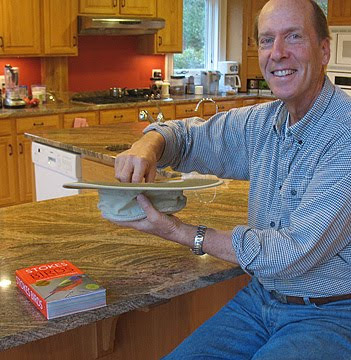 Here is a link to peak inside the guide. 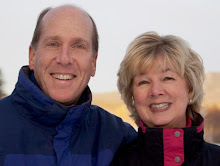 "And because we, Lillian and Don, are a married couple and a team in every way, we want to thank each other for the tremendous hard work, patience, humor, and love that sustained us through this immense undertaking. We were able to create an atmosphere and work environment where each of us could contribute the best of our individual skills and abilities, resulting in the best guide we could make." Today we are celebrating our accomplishment (hey, our advice to authors is to celebrate early and often, because if you don't do it, who will?) and we hope you all are enjoying your copies of our guide. Many of you own this guide, but some of you still may not know about it. Enter the contest and you could own one. A few days ago we had a Hermit Thrush in our yard, eating pokeberries. 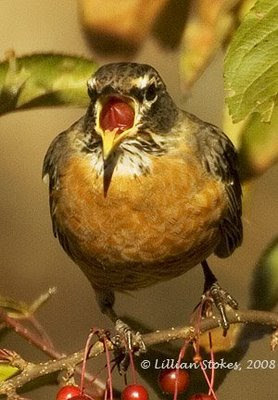 This lesser-known relative of the American Robin has a beautiful song and breeds across much of Canada, the West and upper eastern parts of the U.S. It winters in the lower third of the U.S. and beyond. 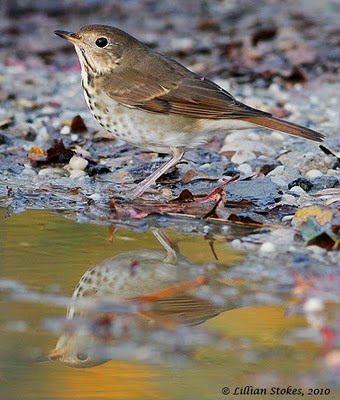 Watch for this thrush now, during its migration, and look for it in southern areas in winter. 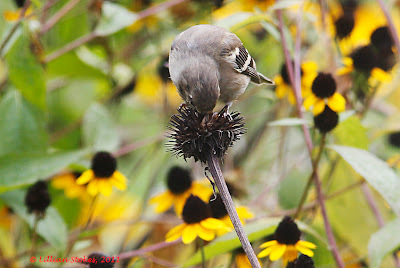 American Goldfinch feeding on the seeds of Purple Coneflower (Rudbeckia purpurea, yellow Rudbeckia triloba in background). Reason number 2 why you have no birds at your feeder. "Yum, I don't need to visit the Stokes thistle (nyjer) feeder when all of this is available!" 1. There was an abundance of rain this growing season in many parts of the country, producing bumper crops of wild foods. 2. There are lots of wild seeds of composite flowers available, such as Rudbeckias (Coneflowers), Coreopsis, Sunflowers, Asters and others. 3. There are tons of tasty weed seeds available, such as smartweeds, pigweeds, goldenrod, etc. Sparrows love all these seeds. 4. It is a bumper year for berries — Holly, Chokeberry, Dogwood, Pokeberry, raspberries, etc. 5. Crabapple trees are heavy with fruits. 6. The cone and seed crop on many trees has done well. Here, in NH, we have many Hemlock cones, acorns, birch seeds, Spruce cones, etc. 7. The weather has been warm and birds do not need to eat as much as they do when the weather is colder and they need to keep warm. 8. Because of warm weather some insects are still available and have not gone into dormancy. 9. Fall is migration time for many raptors, some of them hunt birds at your feeders. This morning we had a Cooper's Hawk, juv., sitting in a tree in our yard. The wise feeder birds had sought cover and were nowhere to been seen. In general, these hawks move on. 10. It is a self-fulfilling prophesy of "there are no birds at my feeders so I do not have to fill the feeders." 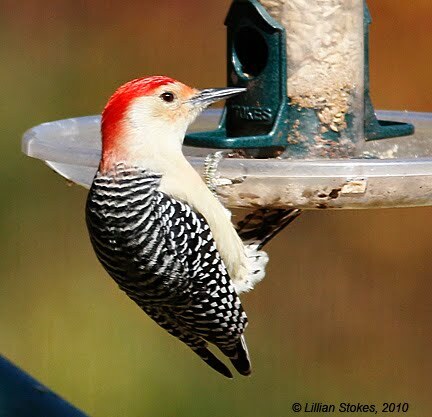 An empty feeder will not attract birds, especially any of the ones that are still around. Birds like chickadees, titmice, nuthatches, are permanent residents in an area and, even though they are not at your feeders now, come colder weather they will return, but not if the feeder is empty. So keep those feeders full! Soon he will look like his Daddy, here. Wow, this is one strange looking Cardinal we thought when we looked in the shrub behind our feeder. We know this is a late stage juvenile Cardinal molting into his adult plumage. Notice the all black bill, mottled appearance and the grayish plumage on his back. 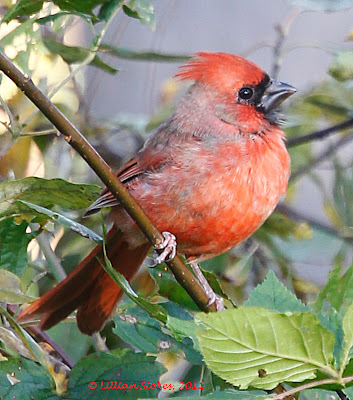 Fledgling cardinals are mostly brownish with a black bill and little or no black around the bill. Watching young birds slowly acquire their adult colors is one of the cool things about feeding and attracting birds in your backyard. Hairy Woodpecker, male, l., Black-capped Chickadee, R. at sunflower tube. Right now we are getting reports from New England to FL that people are worried because they have no birds at their feeders. We have fewer birds at ours. Relax, they will be back, as soon as it is colder, and the wild foods have been depleted. There is a great abundance of wild food now available to birds. All the rain we have had in the East, from spring (remember the record floods) through summer and into fall, has made for a bumper crop of many wild foods. Plus the weather temperatures have been above average. Here in NH, our crabapple trees are loaded (although robins have been visiting them), winterberry holly is full of red berries, other berry producing trees and shrubs are laden. This was a very good blueberry year. The fields are full of the seeds of grasses, weeds, coneflowers and other composite flowers. There are acorns and our hemlock trees have lots of cones. However, winter is coming. It will get colder. Insects will disappear or hibernate. Seeds and berries will get eaten. Then the birds will come back to your feeders. Meanwhile, keep good bird feeders clean and stocked with quality bird seeds. Sooner or later they will be back. Promise. 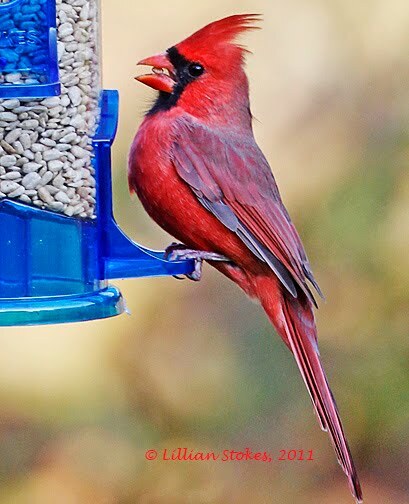 For more, click here to see the Top Ten Reasons Why there are No Birds at Your Feeder. 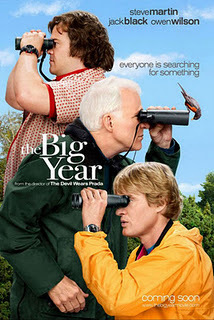 Just went to see the comedy, The Big Year movie, about a birding competition starring Steve Martin, Jack Black and Owen Wilson. Bottom line, I liked it, go see it. Basically it's a movie about competition and relationships, set against the backdrop of birding. 3 guys are vying for who can see the most species of birds in a year. As a comedy it's more occasional chuckles than laughs. There are touching moments, adventures, and each guy emerges with an acceptance of who they are or have become. There is far, far, too little footage of birds shown, but at least they show some birds, even sometimes accurately depicted as to correct species in correct habitat. It does show birding in real birding locations. If you're a birder I hope you see a little bit of yourself in the movie and remember the passion that made you become a birder in the first place, the adventures you've had, and the birds you've seen or want to see. If you're not a birder, it will introduce you to what birding can be like, especially when taken to it's extreme. I hope it makes you want to pick up binoculars and go places to see amazing birds. Just like the title of the song says, that plays at the end of the movie during the rolling credits while numerous photos of birds flash on the screen — "This Can All Be Yours Someday". We hope it does. We won't give too much away, and not everyone will like this movie, (the story line is fragmented, there are lame moments, and birders will find the inaccuracies) but keep and open mind and go and have fun. 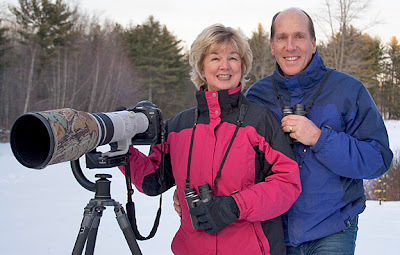 The two (won't tell you who) who become a couple at up the end, birding brought them together. That's awesome. 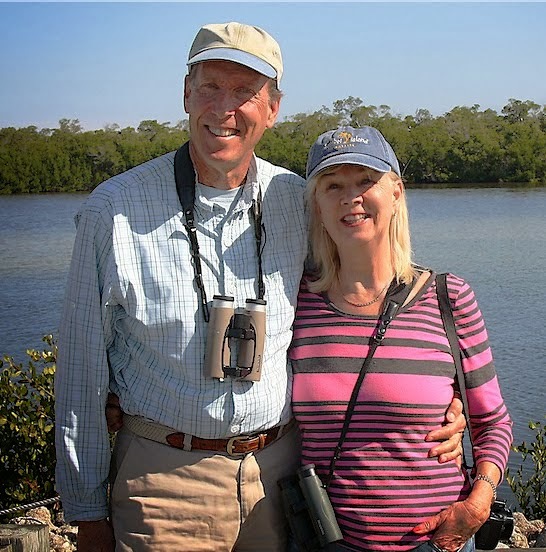 We know, because birding brought Lillian and Don Stokes together. We'll let you know what we think after we see the movie. Are you going? Hey, if this movie gets anyone new interested in birding, then great. the other morph has black-and-white head stripes, as here. There is much individual variation. They all have white throats and are very common at many feeders in winter. The dramatic adult White-crowned Sparrow has beautiful black head stripes and a white central crown stripe. White-throated Sparrows are migrating and coming to bird feeders across much of the country now. 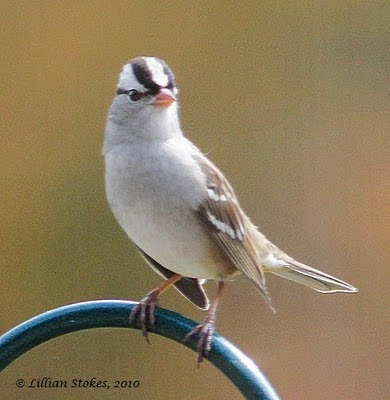 Somewhat less common here in NH, White-crowned Sparrows are also migrating and coming to feeders. 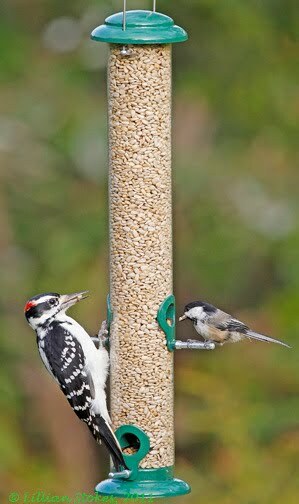 Both these species winter across much of the country and you may have them at your bird feeders all winter. We recently had first-winter White-crowned Sparrows at our feeder amongst the many, many White-throated Sparrows. These sparrows love to feed on the ground on millet or seed mixes containing millet. We make a special sparrow feeder by building a big brush pile and sprinkling the seed in front and under the pile. It's a sparrow magnet and provides perching spots and cover from predators. 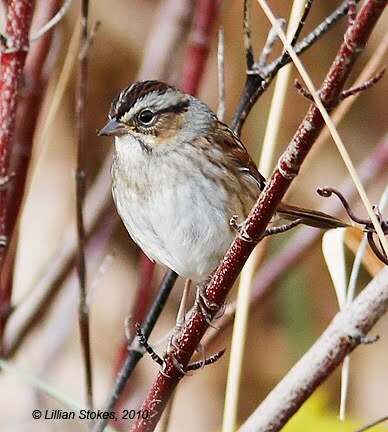 The big bonus for us is that we get to see lots of fall sparrows. 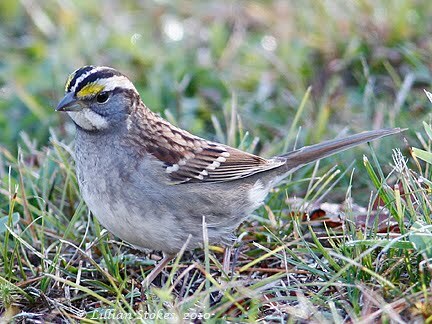 If you live in the far western part of the country, you will get lovely Golden-crowned Sparrows visiting your bird feeders. They have a golden forecrown, surrounded on the front and sides by black or brown. All these sparrow species are in the genus Zonotrichia. 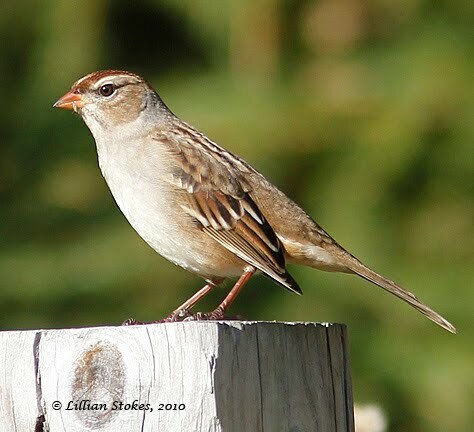 We discussed the characteristics of the sparrows in the Melospiza genus as stated in our new The Stokes Field Guide to the Birds of North America. 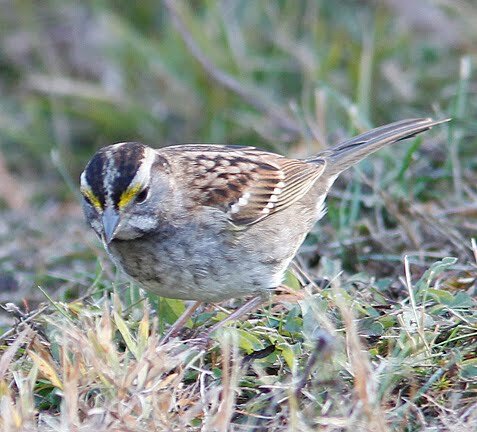 In our guide, p. 656, we discuss the Zonotrichia genus and say these are "large deep-bellied, broad-necked sparrows with a fairly small conical bill, rounded crown and fairly long, slightly notched tail." In addition to White-throated, Golden and White-crowned Sparrows, the Zonotrichia genus includes Harris's Sparrows. Tip: Look at these sparrows through your binoculars at your bird feeder and learn the characteristics of the shape of each genus. You will get better at ID-ing them and it will set you up to learn the sparrows in other genera. Sparrow ID can be challenging, to say the least. At the Dead Creek WMA in VT, we once saw this lovely Swamp Sparrow, hanging out appropriately, in a swampy area at the edge of the water. Birds are often habitat dependent and thus the Swamp Sparrow's name. This is a subtly beautiful sparrow with a strongly marked face, russet wash along flanks and reddish-brown on crown, wings and tail. 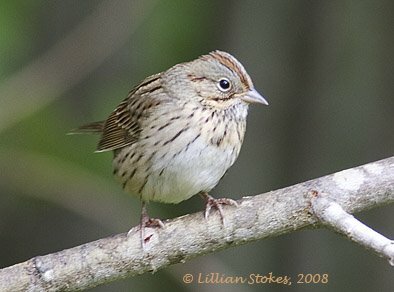 Swamp Sparrows are in the genus Melospiza, along with Song and Lincoln's Sparrows. 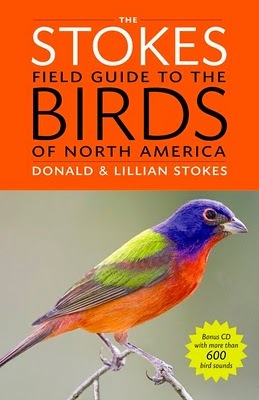 In our new The Stokes Field Guide to Birds of North America, in addition to individual thorough species accounts with multiple photos per species, we have colored boxes where we give helpful Identification Tips and an overview for many of the bird families. Look for these in our field guide. "Sparrows are small birds with short conical bills and varied-length tails. They are birds of primarily grasslands, fields, and open edges, where they feed mostly on seeds and some insects. Most are brownish with streaked backs, and they can look quite similar. Fortunately there are several large genera that have subtle but distinctive shapes. Becoming familiar with these shapes can help you place an individual sparrow into one of these groups, or genera; then you can look for plumage clues to complete your identification. 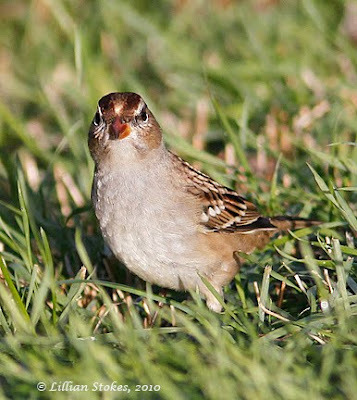 Species ID: There are 12 genera of sparrows in North America. Only 5 have 3 or more species, and these are the ones that are most useful to know to use in this generic approach. * Melospiza: Medium-sized to large sparows with rather average proportions: they are slightly deep-bellied and have a medium-sized bill, rounded crown, and fairly long rounded tail. These sparrows are easily seen in brushy areas and marshes; when flused or curious they tend to fly up to higher perches for long periods and give short alarm calls. 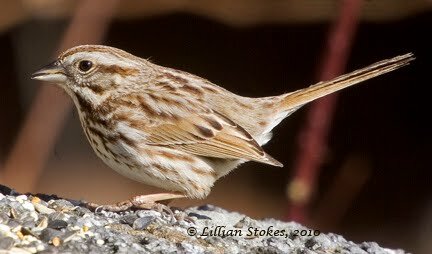 Some (Song Sparrow) come regularly to bird feeders. Includes Song, Lincoln's, and Swamp. We had this gorgeous male Red-bellied Woodpecker visit our feeder. This is not a common woodpecker species here in southwestern NH. We are at the upper end of it's breeding range, although it has occurred north of here in winter. 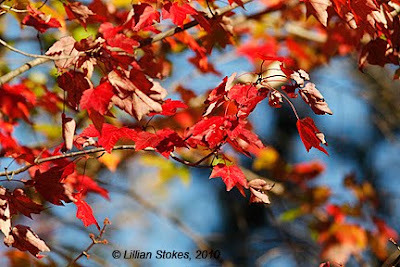 Keeping with the red theme, the Red Maple leaves are peaking now in their most vibrant fall colors. We walk around oooh-ing and aaah-ing. 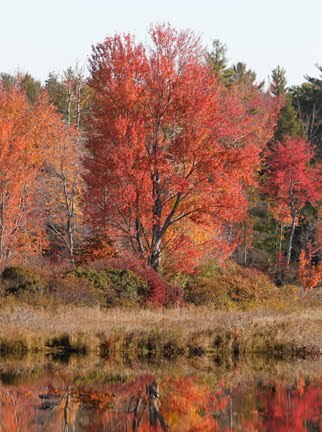 Red Maples, lit like glowing embers, spill reflections on the pond we live on. It's peak leaf peeking, soon to be over. 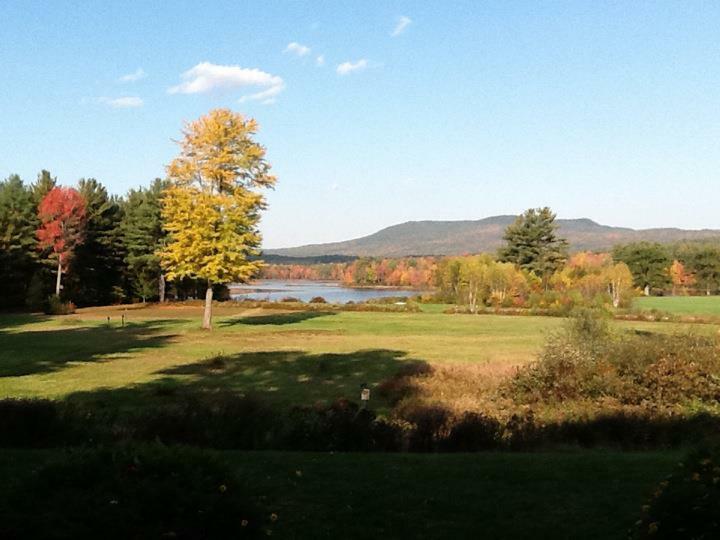 There's nothing like the fall colors in New England. Enjoy. The Big Year is a comic movie directed by David Frankel, releasing nationwide Oct 14th, based, roughly, on the book of the same name, The Big Year by Mark Obmascik, about a competition called the Big Year, an informal birding competition to see which birder can see or hear the largest number of species of birds in a given area in one year. It stars 3 guys, (Steve Martin as Stu Preissler, Owen Wilson as Kenny Bostick, and Jack Black as Brad Harris), each undergoing his own personal crises — one a mid-life, one a late-life, and one a no-life crises. Stu and Brad team up to try and beat Kenny's North American record of 732 species. Advance word is that this is a funny movie, reason enough to go. We are eager to see it. The case is out, so far, how it portrays birding. If it gets more people interested in birds and birding, then great. Here are the trailers, with a few explanations. for the non-avid birder. The original trailer pitches the movie to the largest possible audience, (not mentioning the word birding), as big adventure and a friendly competition between 3 guys. The "bird fallout" is a real thing and does occurs when a group (of sometimes very large numbers) of migrating birds are grounded due to weather conditions, such as strong north winds blowing on the Texas Coast so that northward migrating birds in spring, who have just crossed the Gulf of Mexico, are forced to land. Stu and Brad get Kenny worried that his record will be broken. Evidently Kenny thinks his record is safe, but then has a wake-up call. 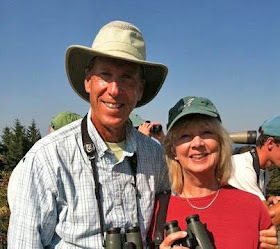 In the book The Big Year, in 1998, three different birders, Sandy Komito, Al Levantin and Greg Miller (who is still an active birder see Greg's website here) chased Sandy's record of 721 birds but Sandy then set a new North American record of 745 birds. Is anyone challenging that record today? 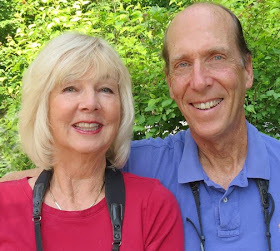 Yes, at least one birder, named John Vanderpoel, who has a blog, is attempting a Big Year and as of Oct. 6th he has seen 726 species. There's still time to break the record. By the way, a Big Year area covered here means the American Birding Association area of the 49 Continental U.S. States including Alaska, and Canada and the French islands St. Pierre and Miquelon, plus adjacent waters to a distance of 200 miles from land or half the distance to a neighboring country, whichever is less. Excluded are Bermuda, the Bahamas, Hawaii, and Greenland. Many people do their own Big Year. It can mean how many birds seen in one year in a single US state, or Canadian Province, or hey, make up your own idea, and see how many birds you can see in one year in your own back yard! Kenny tries to get Stu seasick on an ocean birding trip. Lots of birders go on pelagic trips out into the ocean to see cool birds. Besides gulls, birders are particularly eager to see pelagic birds, such as Albatrosses, Shearwaters, Petrels, or Storm-Petrels. If you do go, here are some hints to prevent getting seasick, such as don't eat a big greasy breakfast of eggs, home fries, and lots of bacon. On pelagic birding trips they may "chum", or drop fish parts over the side, to lure in fish eating birds. A Pink-footed Goose, a rare bird, has been spotted at the end of the narrow boardwalk. Kenny runs ahead of people, Stu and Brad wait and let the explorer scouts pass by them and miss the bird. Birders doing a big year must drop everything in an instant to race to a rare bird sighting. There is always the risk they will miss the bird. Birders well know the feeling of elation in seeing a rarity and the letdown of a miss. 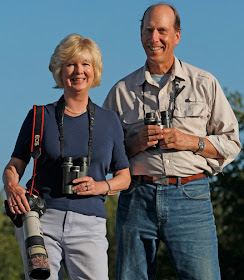 In the birding world there is much discussion as to how birders should act, especially around a rare bird event. It is important to not stress or scare the bird, or behave badly towards other people, or break laws. The American Birding Association has a birders code of ethics, which every birder should know. Birders will pick apart the accuracy of this movie in terms of the birds. Will the movie have the right species of bird in the right habitat? Probably not always. Greg Miller was a birding consultant to this movie, and often on the set, but ultimately, the producers and directors decide what they think makes a good movie, bird inaccuracies aside. Would a Pink-footed Goose (a species from Iceland and Greenland that sometimes appears in the northeast U.S. in winter), be found near a Calliope Hummingbird, a small hummingbird of the West? Unlikely. 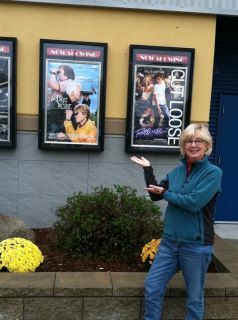 Go see the movie and let us know how you like it. Lincoln's Sparrow (Melospiza georgiana), note buffy cinnamon wash on breast. They can often have a breast dot, so do not confuse them with Song Sparrows. 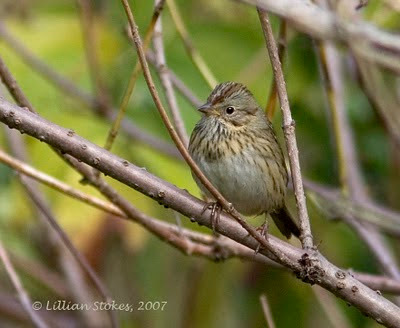 Lincoln's Sparrows are in the genus Melospiza, along with Song and Swamp Sparrows. Sparrows are beginning to show up here in southern NH, with many White-throated Sparrows, as well as Lincoln's, Savannah, Field, Chipping and Song Sparrows being seen. Juncos have barely shown up yet. Lincoln's Sparrows, an uncommon migrant here, are always a treat. I love their subtle colors (yeah, I know all sparrows, just about, have subtle colors, but humor me here), with that pale buffy cinnnamon wash on the breast. Ooooh. Saw some yesterday and today in our yard. 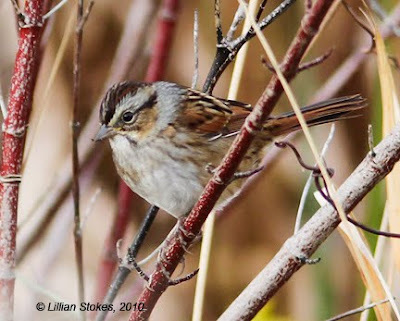 Lincoln's Sparrows breed north of us, in boglike areas and shrubby streamsides, across much of Canada, into Alaska, and down into mountains of the West. They winter on the West Coast and much of the lower quarter of the U.S. You can see them in many places in the U.S. during their migration. Get those binos out and start looking!